So, the years-long rumors are true: McLaren Hospital will be partnering with MSU and building a hospital at the edge of Lansing in the University Corporate Research Park east of 496. LANSING — McLaren Greater Lansing will consolidate operations at its two south Lansing facilities into one $450 million hospital on what was once farm land near Michigan State University, the hospital announced Monday. Work on the project will begin in spring and should be completed by 2021. The new campus will be paid for through bonds, Mee said. Finally, Lansing won't be the red-headed stepchild for its own medical school;, which was always crazy to me. This will be MSU's flagship hoospital campus allowing it to recruit nationally like the school currently does in Grand Rapids and like UofM does for its massive hospital. Wow this is major! So is McLaren looking to take over from Sparrow? The MSU College of Human Medicine students do rotations at Sparrow but I don't know of any that do rotations at McLaren. I know we've talked about it elsewhere before, but I really wish they would have decided to put this in a location that is easier to access via public transit (along Michigan Ave). With the Michigan Museum Place project falling apart this could have worked perfectly there. I have mixed feelings, the Forest Park neighborhood is not in favor due to Forest road capacity and ambulance traffic. Jared, there is ample space in other locations in Lansing and on campus but there are legal restrictions limiting hospitals from moving more than three miles from their current location. (The exact legal nature I do not know but that was a factor, a poor argument in my mind for this location.) I do not care for those 10 acres of parking off of Forest, and the bus service in the area is inadequate. Deep skepticism on this project. Yeah, thanks for the reminder about the 3 mile radius. But I also wouldn't be surprised if special legislation or allowances couldn't be passed that would make an exemption for them. I do feel bad for the south side of Lansing though. The Forest Park neighborhood isn't that far from Sparrow and MSU has a clinic on campus (not a full fledged hospital). This will leave the south side of Lansing with a large hospital shortage. No, they said their partnerships with their existing hospitals will continue. They'll just finally have their base in Lansing and will expand their partnership with McClaren. So, they'll still have students at Sparrow facilities, just probably fewer. My very first thought about this location is that Forest Road can not handle the traffic. The road barely has curbs at spots, let alone sidewalks. It's one of the most rural feeling roads in the entire city. How they are going to rework it or find another route to the hospital, I have no idea. While definitely not as convenient as their current campuses on the Southside, this is still the southside. It's literally in the Forest View neighborhood. There would also be nothing from preventing CATA from running a few extra buses this way if that's what they need to do. I wish they could have more centrally located this on the southside, but the expansion of the partnership needed to have happened years ago. It was an embarrassment to the region that this 50,000-student university, one of the largest in the country, outsourced so much of the College of Human Medicine all the way in Grand Rapids. I'm glad they are finally remeding this. This was long overdue and give Lansing something else to recruit business. I'm not happy with the location but I understand the limitations and why they made the choice. Forest Road will certainly need some significant improvements to accommodate this hospital, but something as simple as adding a turn lane along with curbs and gutters would probably be adequate, it would also be nice to see it extended through to Hagadorn. The site layout looks an example of what not to do though, I would have been content if the buildings were oriented towards the freeway or Forest/Collins, but not in the center of the property amongst a jumbled mess of parking lots. The biggest disappointment here is the Greenlawn campus will be closed. I can't imagine another good use for that complex without getting very, very creative (or being optimistic about the demand for office space in that area). The neighborhood surrounding the Greenlawn campus is pretty decent and has been very stable over the years, I hope the city does whatever it takes to get that campus redeveloped as soon as possible. 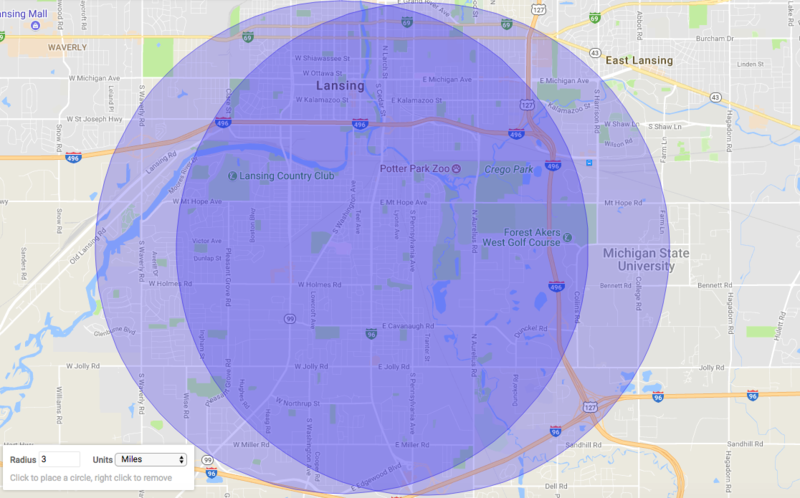 If that campus were left neglected it could have a devastating domino effect on that area, Lansing cannot afford to have the southeast side go the same direction as the southwest. All-in-all I'm sure this will be a very good thing for the area at large. I'll be anxiously awaiting the finalized plans and seeing cranes in the air, this one may actually move along quickly. Yeah, I think losing the Greenlawn campus will definitely hurt the businesses in the area, particularly the ones along Cedar. As for the residential neighborhood, however, I've always gotten the impression that it wasn't an economic plus for the residents. It kind of existing as an island within the neighborhood. I don't think many of its employees actually live in the surrounding neighborhood. Their expansions were actually bursting at the seams, and they've had to physically cut a lot of hospital traffic off to the surrounding neighborhood. This is one of the few areas I'd like to see them actually down-zone. I'd redevelop the historic portion of the hospital and the modern medical building as retail or office space with minimal neighborhood retail on the ground floor, and then redevelop the parking lots with attached single-family housing or maybe even small apartment buildings. But the giant, looming patient tower will probably need to come down. As for the Alpha Access/Pennsylvania campus, the area immediately west of the hospital is all warehousing space, and it's likely that's what you'd redevelop that land as unless there is demand for single-family housing down that way. But, McLaren could actually keep this one largely as-is, too, since it's mostly a rehabilitation hospital. It doesn't have its own emergency room, so it functions more as a medical office building, anyway. You can sign-up for updates there and such, and there will be meetings. I'd definitely favor them putting the parking into a garage like Sparrow has been doing at its downtown campus. I know they probably feel they don't have to since the new site is so expansive, but they really should. It'd give them room to grow, too, without having to maintain and later tear-up a parking lot. Wow, you folks are on the ball around here! I have to agree with the majority here in that the new location is far from ideal. If there were no restrictions on distance from the current location. It would make a lot more sense to build it close to the south-side biomed research complex... like near Hagadorn and Mt. Hope. Or even moving the new site a little bit north onto the remaining part of Spartan Village, which is due to get knocked down sometime soon. Harrison and Mt. Hope are much better access roads, and there's potentially even enough space to build an on/off ramp from 127. One other point, don't forget that although the CHM MD program is based in Grand Rapids, MSU has a DO medical school here. This looks to be a good thing for Lansing and MSU. The location while next to cornfields and horse pastures the site really is central to the whole Greater Lansing area. If it were not for MSU this area would have been developed long ago. I believe MSU owns the land with the pond on the other side of the highway, maybe they could build another access road along the highway with new under or overpass near the new hospital. Maybe a small"parkway" along the west side of the golf course from Mt. Hope. It is not where I would site it but I am happy that it is within the city of Lansing. I thought they talked about redeveloping the two south Lansing locations. Here is a three-mile radius map from the Greenlawn site and the orthopedic site on Pennsylvania. Spartan village would be in range. With a $450 million project the location should be very well thought out. This site does not appear so at all. I do not know if the move is three miles from both hospitals but Spartan village would fall in here. I know MSU is quite reticent to tell anyone what they plan on doing so transparency is an issue. Yeah, Spartan Village puts this closer to transit (bus and train) as well as just as close to a freeway entrance/exit. Spartan Village is also within East Lansing though, I bet that played a factor in the various subsidies that they will be asking for. I wish the two communities could work together to put this in a better location and provide the subsidies that potentially only Lansing can provide.